Whoops, I forget to get back the post I started on Walter Wink. He was wondering about "angels of the churches" in Revelation. His answer? 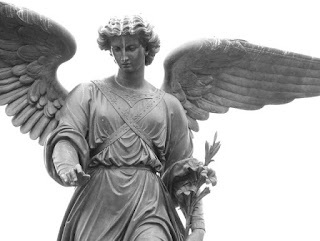 Instead of being angel figures like white-clothed figure with wings, he proposed that they are the corporate personality of the church - its ethos or spirit. Looking back over my own experience of churches, I realized that each did indeed have a unique personality. Furthermore, that personality was real. It wasn't what we call a "personification" like Uncle Sam or the Quaker on the box of oats. He goes on to notice this idea of angels that seem to be of nations in the book of Daniel. In fact, he starts realizing that lots of structures - especially ones that have power - have a sort of spirit. Corporations, governments, universities, institutions. And these are big players in the world - the kind of structures or systems that exert power on us. That can do moral things - good or evil. A corporation can provide needed medical drugs or it can withhold them. A government can assist the weak or oppress them. But who does the husband-abandoned welfare mother who can't get child-care aid blame? The CEO? The Mayor? We often do, but these people aren't usually trying to create evil. They are are many layers removed. And they are working withing a great system of powers - economic and political. She becomes the victim of evil but it's hard to see who made that willful choice.